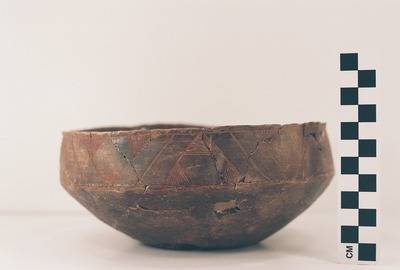 "41AN38, 8, 3" by Timothy K. Perttula and Robert Z. Selden Jr.
DECORATION: The rim has an engraved motif repeated 10 times around the vessel between upper and lower horizontal engraved lines that encircle the vessel. The motif is comprised of an engraved triangle with either horizontal or diagonal hatched lines at each of the three corners of the triangle. The points or apex of the triangle rotate from touching the tip of the rim to touching the carination. The triangles are separated from each other by two diagonal engraved lines. Poynor Engraved, var. F carinated bowl, Feature 8, Vessel 3 from the Lang Pasture site.